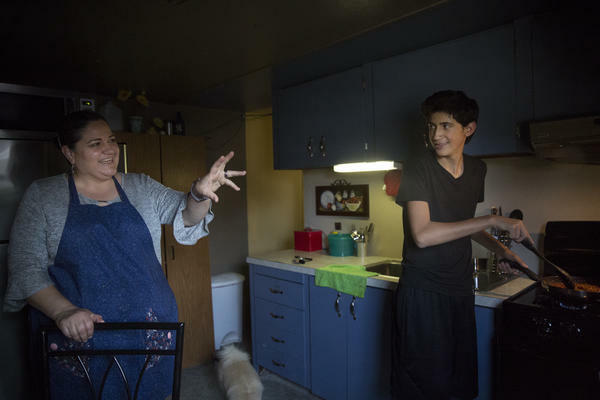 For as long as he can remember, Angel Benavides, 14, has missed the beginning of the school year in Texas because his parents, Juan and Aracely Benavides, work in North Dakota until the harvest is through. 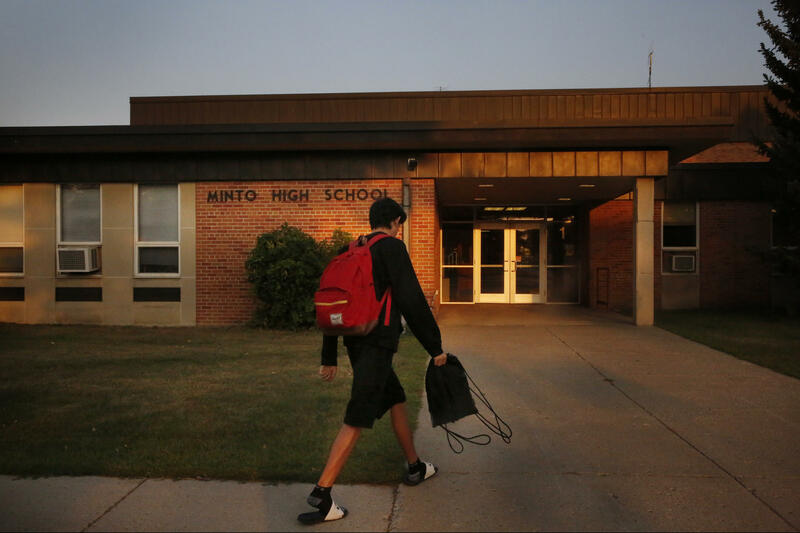 In August, Angel started ninth grade at Minto High School. He spent his summer taking classes down the road, at a summer school specifically for migrant students. 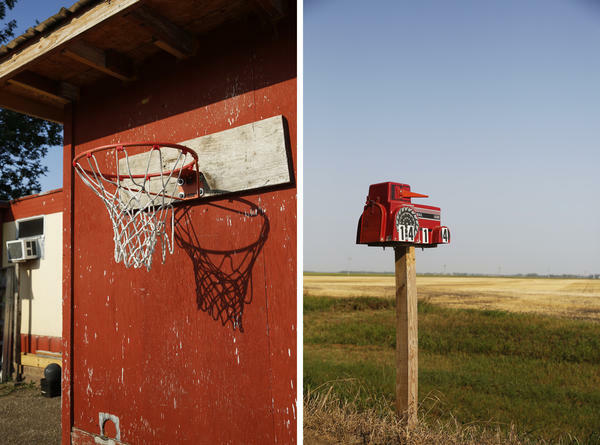 If the North Dakota harvest wraps up in time, Angel plans to try out for his Texas high school's basketball team. Left: Angel's basketball shoes. 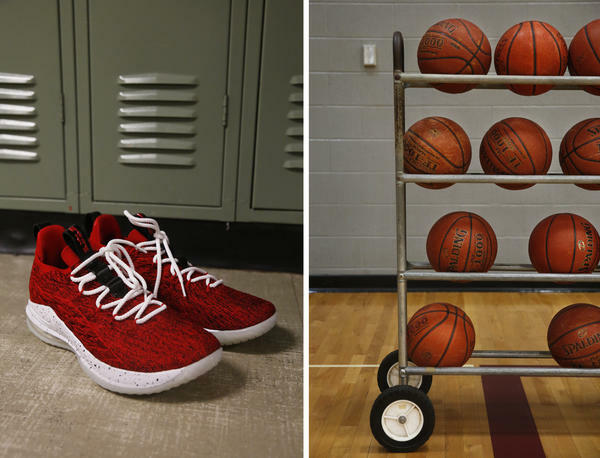 Right: Basketballs in the Minto High School gym. Angel prepares for computer class at Minto High School. Angel plays basketball before starting the school day in Minto. The Migrant Education Program helps schools like Angel's enhance resources for all students throughout the year. 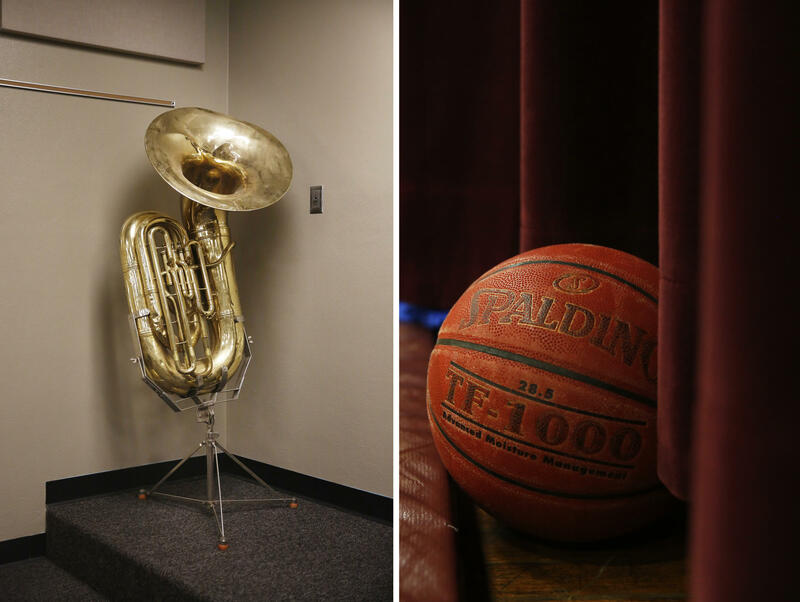 Left: A tuba at Minto High School. Right: A basketball in the Minto High gym. In the early '90s, before Angel was born, his parents started migrating to North Dakota to harvest potatoes, corn, beans and beets. 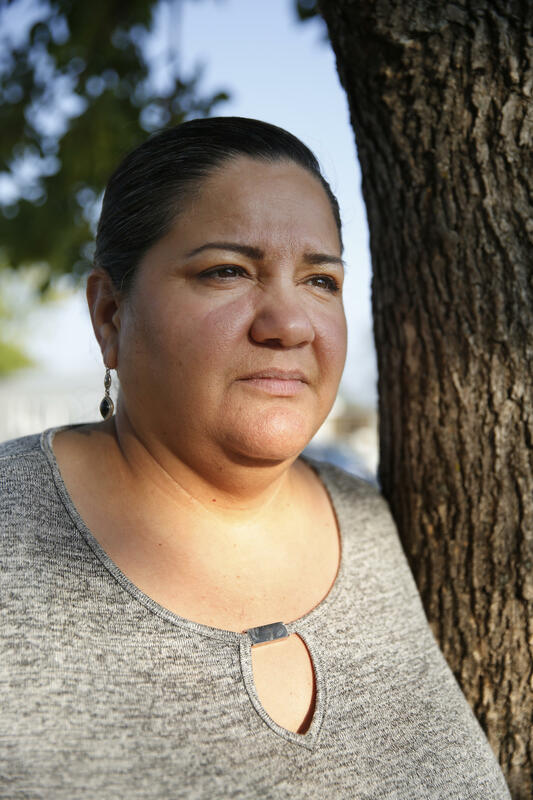 Angel's mom, Aracely, also grew up in a farmworker family. In sixth grade, her dad took her out of school to work in the fields because the family needed money. 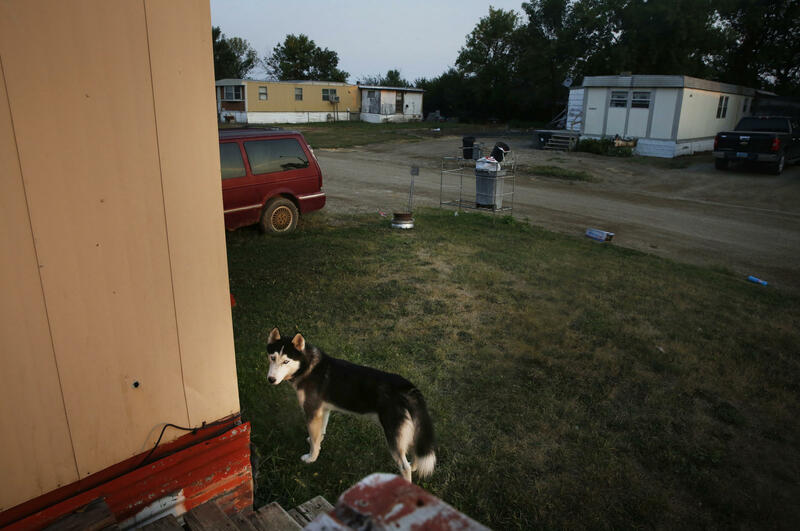 Angel and his family live in a mobile home park with other farmworker families in Minto. Angel waits for his father to get home from work. 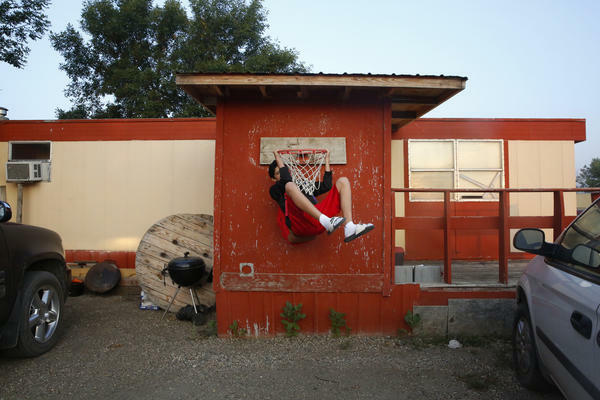 Left: The basketball hoop outside Angel's family's mobile home. Right: A mailbox by the road in Minto. Angel and his mom, Aracely, cook dinner after school. North Dakota farmland in and around Minto. Angel visits his father, Juan, at work as he prepares machinery for the corn harvest. 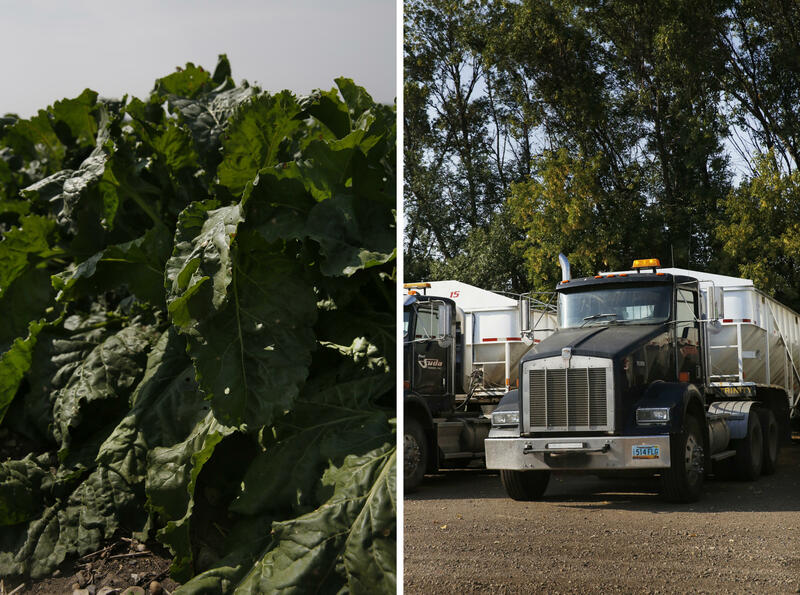 Left: Sugar beets. Right: Farm trucks outside Minto. Angel has been practicing basketball all summer. He says he's prepared for tryouts. "Whether the coaches think that, that's up to them." 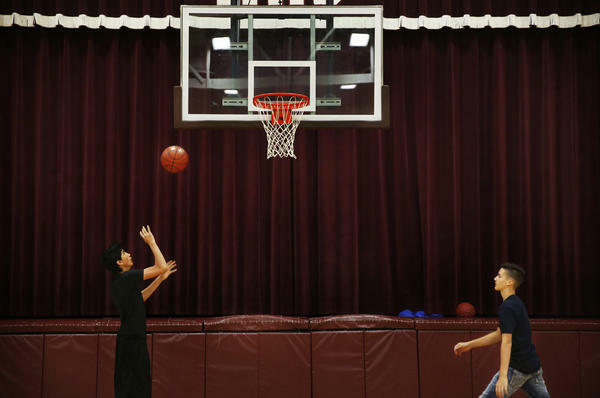 Angel Benavides, a lanky 14-year-old, dribbles down the basketball court of his school gym in Manvel, N.D. It looks like he's going for a layup, but when he realizes he's unguarded, he stops in his tracks and takes a three-pointer. It's a nice arching shot, but the ball bounces tenuously on the rim and doesn't go in. 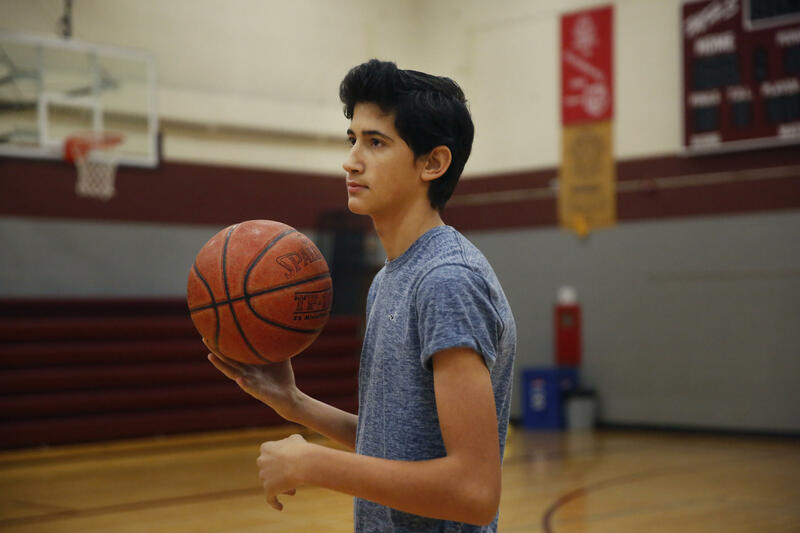 It's late June and Angel is already thinking about playing for his high school basketball team in Texas, 1,700 miles away. But he doesn't know if he'll get there in time for November tryouts. That's because Angel's parents are farmworkers. In the early '90s, before Angel was born, his family started migrating from Texas to North Dakota, where there was work harvesting potatoes, corn, beans and beets. For as long as he can remember, Angel has missed the beginning of the school year in Texas because his family stays in North Dakota through the harvest. It's weather-dependent, so there's no hard end; all Angel knows is they'll head home to Texas sometime in October or November. In June, when a lot of kids are on summer vacation, Angel is in a summer school specifically for migrant students. His big goal is to complete Algebra One. It's not that he didn't pass it the first time; he's working on getting ahead. Angel says back in seventh grade, his Texas school offered a test to get into the advanced math track, but he wasn't back from North Dakota in time to take it. "And they called my name, but because I wasn't there they took me off the roster." Migrant students face this all the time. Angel, who was born in North Dakota, says he feels society has lower expectations for him because he moves around so much. "When they say, 'Oh, you're not going to do this,' and they bring me down, that actually motivates me to prove them wrong." So while his dad works the harvest, Angel hits the books. If all goes well, when he gets back to Texas, his summer school credits will transfer and he'll start advanced math. Angel's summer school is funded by the Migrant Education Program. In 2017, the program put more than $350 million toward supporting kids whose parents move for agricultural and fisheries work. The money pays for, among other things, after school tutoring, academic advising and night classes for teens who've dropped out of school to work in the fields. The program began in the 1960s, as a part of President Lyndon B. Johnson's War on Poverty. The Department of Education doesn't track graduation rates for migrant students, but advocates and educators estimate that when the program first started, less than 10 percent graduated from high school. Now they say that number is closer to 70 percent, which is still short of the national average. "This is a population that is often underserved and difficult to find because of the fact that they are mobile," says Angela Branz-Spall, head of Montana's Migrant Education Program and a longstanding leader in the field. "It's not readily apparent to schools or agencies serving them," she says. "They may need coordination so ... they can graduate on time." The Migrant Education Program helps to provide that coordination. And the money doesn't just benefit migrant students: It's used to employ teachers and bus drivers during the summer, and it enhances school resources for all students throughout the year. "Economically, it always made sense," says Tom Ferry, a North Dakota farmer and a former school board member who oversaw Angel's Manvel school. The program is good for farmers, according to Ferry, because it draws farmworker families. "Some of the work that the program did encouraged the people to come back," Ferry says, year after year. "Since I'm not there, I can't join"
The Migrant Education Program has helped Angel keep his grades up despite the yearly shuffle. But the program can't help him get back to Texas in time for basketball tryouts, and Angel feels sad sometimes thinking about the other parts of school he misses out on. "There's a lot of activities but it's in the beginning of the year — September or August," he says. "And since I'm not there, I can't join." He'd like to do something called the University Interscholastic League. "They're like competitions for mathematics, science, history, spelling, reading ... pretty much every subject I would like to do," he says. "But since we can't go over there in time, I don't have a chance to do that." His older brother is already in college, and Angel is confident he'll go too. That's a big shift in just one generation. "I don't want to work in some random job to make ends meet," he says. "I want to make money to live a nice life." "I have the chance to educate myself"
Angel's parents both grew up in farmworker families based in Texas, and neither graduated from high school. His mom migrated as a kid to Arizona to harvest apricots and peaches, and to California to work in the vineyards. In sixth grade, her dad took her out of school to work in the fields because the family needed money. That still happens today. Agricultural workers are among the country's lowest annual earners. The Bureau of Labor Statistics estimates their median annual wage was $23,730 in 2017. And because it's seasonal work, the source of the next paycheck is often uncertain. Everything from heavy rain, to no rain, to trade policies and tariffs can impact what a farmworker takes home. 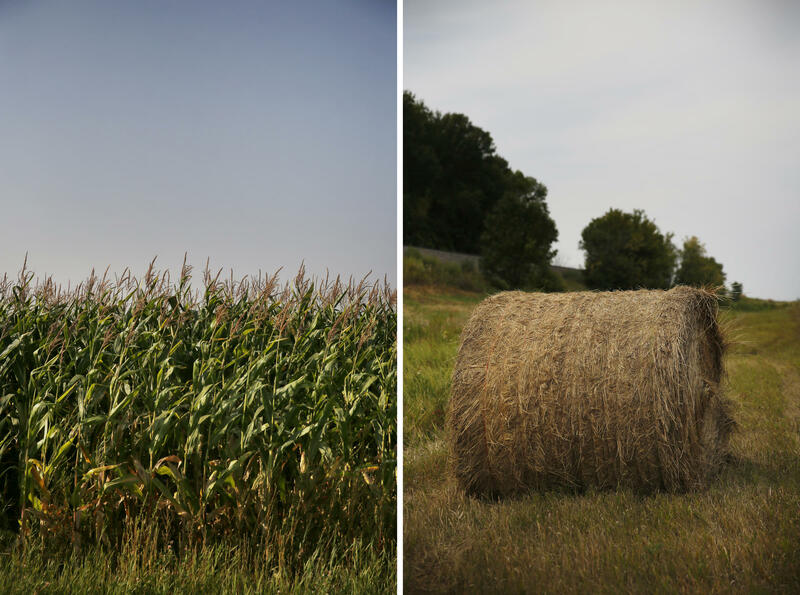 Federal law allows children to start doing farmwork at age 12 with parental consent. They're not supposed to work when school is in session, but some don't have the option. Angel is grateful he hasn't had to work in the fields. Instead, he's been able to focus on schoolwork. He says, for his sake, his mom wishes she could have done the same. "She's like, 'I'm sorry that you have to do this. I know it hurts.' She really wishes that she had the opportunity, because she feels bad that we have to go back and forth. That makes me feel lucky that I have the chance to educate myself." It's early August, and summer school has just wrapped up. Angel has a few weeks before he starts ninth grade, and he's using that time to practice basketball and help his mom around the house. He says his Algebra One class went well — he should be able to get into the advanced math class in Texas. And there's more good news: Angel's dad decided not to work the corn harvest this year, so the family should make it back in time for basketball tryouts. Angel feels good about his chances of making the team. "I'm definitely prepared," he says. "Whether the coaches think that, that's up to them." Tennessee Watson is an education reporter at Wyoming Public Radio. You can find more of her reporting on the Migrant Education Program here. Without seasonal workers, much of American agriculture would stop. Farmers rely on those workers to harvest crops. And when the work is done, they move on, as do their kids - about 300,000 of them nationwide - which means the kids constantly change schools. Wyoming Public Radio's Tennessee Watson learned of one student's journey. WATSON: It doesn't go in. This was late June, and Angel was already thinking about playing for his high school team in Texas, 1,700 miles away. But he doesn't know if his parents will be done working the harvest in time for the November tryouts. For as long as Angel can remember, his family has migrated between Texas and North Dakota to work in beets, potatoes and corn. And every year, Angel misses the first couple months of school in Texas. ANGEL BENAVIDES: There's a lot of activity that they make, like, but it's in the beginning of the year, like, in September, August. And since I'm not there, like, I can't join late because it's already going to be way too late. So I mean, like, besides basketball, I'm, like, cut off from all - pretty much all the other activities. WATSON: And in June, when a lot of kids are on summer vacation, Angel is in a summer school specifically for migrant students. His big goal, apart from perfecting his 3-pointer, is to complete algebra I.
WATSON: Angel is starting high school this fall, and he's using summer school to get ahead. 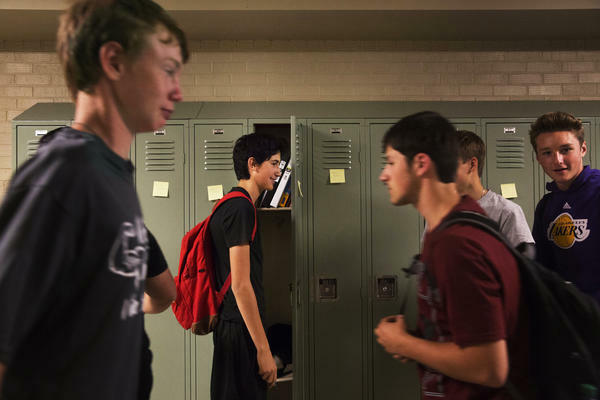 He says back in seventh grade, his Texas school offered a test to get into the advanced math track, but he wasn't back from North Dakota in time to take it. BENAVIDES: And they called my name, but since I wasn't there, they took me off the roster. WATSON: Migrant students face this all the time. Angel, who was born in North Dakota, says he feels society has lower expectations for him because he moves around so much. BENAVIDES: So when they say, oh, you're not going to do this - and they - like, they bring me down. But, like, that actually motivates me to prove them wrong. WATSON: He's grateful for the support he does get - summer school, tutoring, academic advising. That didn't exist for kids like him until the late 1960s. EDWARD R MURROW: Approximately 1 out of every 500 children whose parents are still migrant laborers finishes grade school. WATSON: That's CBS News broadcaster Edward R. Murrow from his 1960 documentary "Harvest Of Shame." MURROW: Approximately 1 out of every 5,000 ever finishes high school. And there is no case upon the record of the child of a migrant laborer ever receiving a college diploma. WATSON: The film galvanized support for migrant farm workers. Six years later, as a part of President Johnson's war on poverty, the Migrant Education Program was born. In 2017, the program put more than $350 million toward supporting migrant students like Angel. BENAVIDES: I want to go to college because, you know, I don't want to work in, like, some random job to, like, make ends meet, you know? I want to make money, you know? I want to live a nice life. WATSON: Farmworkers are among the country's lowest annual earners, according to the Bureau of Labor Statistics. But for Angel, the Migrant Education Program promises a new future. Both his parents grew up in farmworker families, and neither graduated from high school. His mom migrated as a kid from Texas to Arizona following the apricot and peach harvests. In sixth grade, her dad took her out of school to work in the fields because the family needed money. Angel knows that for his sake, his mom wishes she'd stayed in school. BENAVIDES: She's like, I'm sorry that you have to do this; I know it hurts. You know, she feels bad for me that we have to, like, go back and forth and stuff, so - that really makes me feel lucky that I have, like, the chance to, like, educate myself. WATSON: His older brother's already in college. That's a big shift in just one generation. 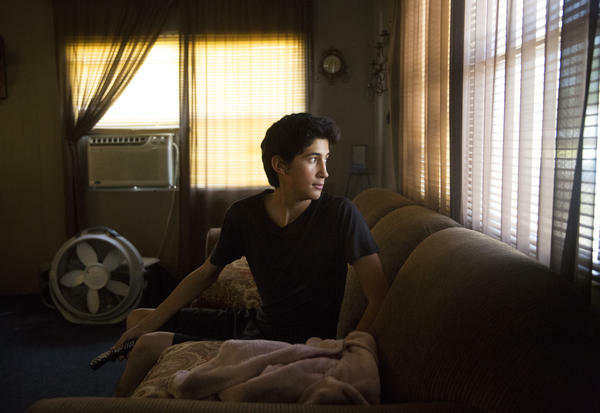 Angel's certain that he'll go to college, too, with help from the Migrant Education Program. WATSON: But the program can't help him get back to Texas in time for basketball. WATSON: Hey. It's Tennessee. Is this Angel? Summer's winding down, and I call up Angel to see how things are going. BENAVIDES: It was pretty good, actually. I finished algebra completely. And I finished, like, 1 1/2 credits already in one summer, so that was pretty nice. WATSON: So when you go back to Texas, do you think you'll be able to get into that advanced math class that you wanted to? BENAVIDES: Yeah. I'm pretty sure I am. I'm already caught up, so yeah. WATSON: And there's more good news. Angel says his dad decided not to work the corn harvest this year, so he can make it back in time for basketball tryouts. For NPR News, I'm Tennessee Watson in Laramie, Wyo. (SOUNDBITE OF MOONCAKE'S "NOVOROSSIYSK 1968") Transcript provided by NPR, Copyright NPR.